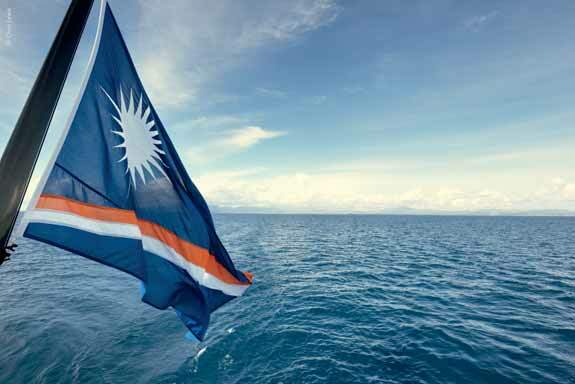 International Registries, Inc. and its affiliates (IRI) provide administrative and technical support to the Republic of the Marshall Islands (RMI) Maritime and Corporate Registries. The RMI Registry is the third largest ship registry in the world, which, as of the end of June 2014, stood at just over 106 million gross tonnes and more than 3,200 vessels (see table). Bulk carriers make up 37% of the fleet in terms of gross tonnage and have an average age of just less than seven years. The RMI Registry continually strives to promote the quality of vessels registered in the RMI. Those vessels operating under the RMI flag achieve the highest ratings in Port State Control (PSC) international rankings. The RMI is the only major open registry to be included on the White Lists of both the Paris and Tokyo Memorandums of Understanding and to hold Qualship 21 status with the United States Coast Guard for ten consecutive years, which is unprecedented. The RMI maintains a comprehensive legislative and regulatory framework, which ensures that the RMI Registry fully complies with internationally agreed-upon standards. An active and well- respected member of the International Maritime Organization since 1986, the RMI participates in all major committee and subcommittee meetings, and has ratified and implemented all the key international conventions and instruments. A signatory to the International Labour Organization’s Maritime Labour Convention, 2006 (MLC, 2006), the RMI conducted a period of voluntary compliance for the inspection and certification provisions of the MLC, 2006, and as of its entry into force on 20 August 2013, now requires compliance for all applicable vessel types within the Registry. The RMI Registry has put a premium on quality since its inception, owing to a unique combination of a commitment to quality, decentralization, and customer service. This commitment is demonstrated through the PSC record of the flag, the implementation of international conventions, and the ongoing efforts to identify changes necessary to remain competitive in today’s economic environment. IRI believes the success of the RMI Registry is due to its qualified personnel, with experience at sea and ashore, who focus on quality, service, and continual improvement. IRI has a network of 25 worldwide offices that have the ability to register a vessel or yacht, including those under construction, record a mortgage or financing charter, incorporate a company, issue seafarer documentation and service clientele. The most important asset to the Registry is its customers and IRI strives to provide them with full service from any office, 24 hours a day.